Dogs will shed hair regardless of their breed: it is a natural process and there is no way to eliminate it. Brushing your dog regularly is however recommended: it stimulates natural oil production which protects their skin and promotes a healthy, shiny coat. There is no doubt that a dog (or more) shedding constantly is frustrating especially if you’re the houseproud type. My advice is to “Let it go”! Funnily enough we discovered that our two short-haired Belgian Malinois leave a lot more hair around the house all year round whilst our long-hair Tervueren tends to lose some of his undercoat in tufts at the change of seasons (Spring/Autumn). Their hair is also coarser with an uncanny ability to wedge itself into clothing right before we need to step out! 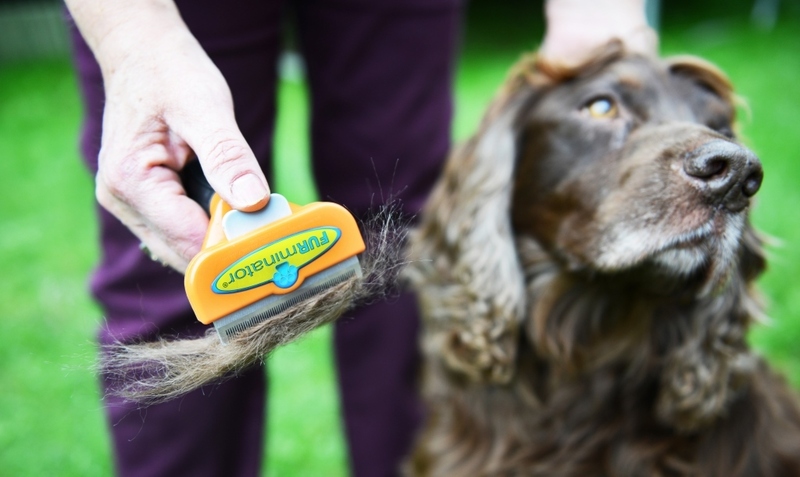 Being lucky enough to have three dogs of various coat lengths, we got the enviable task of testing the FURminator deShedding Tools for both short hair and long hair, which are very similar in size, style and concept. Both promised to reduce shedding by up to 90% which is a big call! 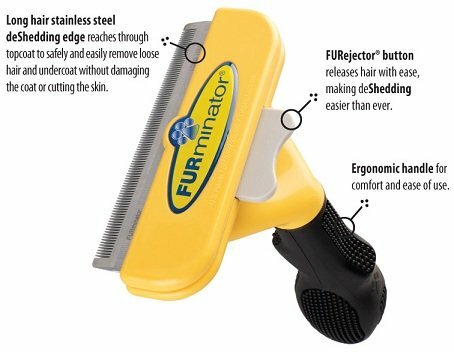 HOW DOES THE FURMINATOR DESHEDDING TOOL WORK? The stainless steel edge (the blade height and width varies depending on the coat length) reaches through the topcoat to remove loose hair safely and easily without cutting the skin or damaging the integrity of the coat. That being said, you need to be gentle with your brushing as the teeth are quite sharp and if you press too hard, well your dog will let you know in no uncertain way and that's the end of that grooming session! The FURejector button (as the name indicates) allows you to release the loosened hair at the press of a button for better performance. All deShedding tools also come with an ergonomic handle for comfort and ease of use. This was probably the main improvement on our previous undercoat brush which had a thin wooden handle and did not feel so steady in our hand. Our Belgian Tervueren Conner is being "FURminated"
The FURminator always grabs lots of fur, so you feel you’re accomplishing something with every brush stroke. It gets rid of the flyaways — those thin, loose hairs lying just underneath your dog’s outer coat. It lessens the degree of shedding that takes place if you use it regularly and consequently, less frequent vacuuming is required. 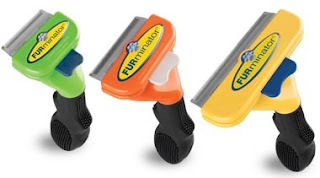 The sharp tiny parts of the razor blades in the FURminator pet brush are somewhat recessed behind solid blades of steel and it does come with a simple protective cover to keep the blades from getting caught on anything — say, while being stored in a drawer or something. Being very wide (10cm or 4 inches) for the larger breeds (23-40 kg), both FURminator models were great for brushing large areas of the top coat but it was more difficult to get into tight places at the “right” angle, or to brush over our dogs’ leg joints. With the long-hair model we found that we removed less of the thick undercoat or the mats and tangles that occasionally build up in our dog's fur over time. Yes, we should brush more regularly but things get missed sometimes! If you brush too hard, you could hurt your dog as the bristles are actually tiny blades so apply only gentle pressure and reward your dog throughout the process to keep him/her calm. 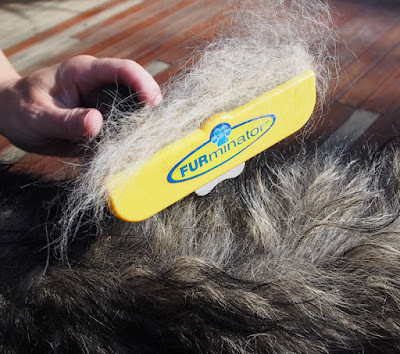 The design of the FURminator uses the traditional razor blade concept but we find that as it is much larger, it works best for full-body maintenance brushing, rather than one-spot detangling or undercoat stripping. The handle design makes it very comfortable to use and makes regular brushing less of a chore. The FURminator deShedding tools come in small (green), medium (orange) and large (yellow) for both short-hair and long-hair dog breeds but also for cats and horses. RRP: $59.99 - $89.99 (for both short-hair and long-hair versions). Available from most pet stores and online. Tip: not all dog breeds will require a deShedding tool, which is designed specifically for those dogs with an undercoat. Its use is not recommended on pets with a particularly sensitive skin.